It’s a big week for what we’re referring to as “cool pop” – i.e. pop which is just a little bit cooler than other pop. There’s new Khalid (who is endlessly cool), boyband Rixton return as PushBaby with an effortlessly cool song and the Jonas Brothers’ has released a song called “COOL” if you need any more evidence!? 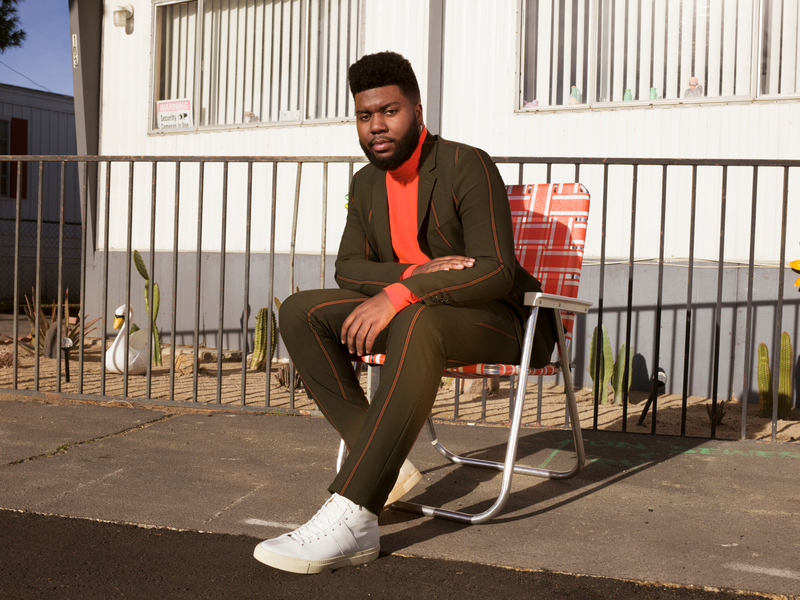 Ever since 2017, Khalid has been constantly releasing and constantly relevant. New album “Free Spirit” balances the line between R&B and pop as perfectly as his debut “American Teen” and contains Disclosure collaboration “Talk” as well as singles “Better” and “My Bad”. Track 10 is this, somewhat unexpected, collaboration with John Mayer. Produced by Mr. Mayer himself, the track is a highlight on the album and is just so smooth. With a beat reminiscent of Pharrell’s “Get Lucky”, you can imagine listening to it whilst driving through the dessert in a camper van… exactly as the album’s cover art would suggest! Push Baby – Mama’s House: If you were into 2010’s boybands then you’ll already know Push Baby by a different name… Rixton! Yes, Jake Roche and his boys are back with a new name, image and sound and “Mama’s House” is their massive return song. Singing about the realities of looking rich and famous but actually being skint, the song is infectious and deserves a massive moment. We’re obsessed. Ariana Grande & Victoria Monet – MONOPOLY: When releasing this song, Ariana and Victoria called it “a thank you to the fans”… if that is the case, then what has the rest of Ariana’s releases been?! It should be no surprise that “MONOPOLY” is really good, Ariana and Victoria are the perfect duo (they’ve been friends for years and have collaborated together a LOT) and the song is on repeat on everybody’s playlist. ANOTHER smash. Jonas Brothers – Cool: The latest single from the Jonas Brothers is a throwback to JoBro of old but, as the title would suggest, it is a very cool track. It’s laidback but has HCV – a new metric we’ve just made up: High Clap Value. You can just clap along to the chorus so easily! We can imagine clapping along to it in the car! We can imagine clapping along to it in the venue! This song should put any fears to rest about the quality of the next Jonas Brothers album due later this year. BLACKPINK – Kill This Love: Let’s not even get started on this. It’s MASSIVE. This song is just sick. We love it so much. We don’t understand Korean but the chorus’ are hooky and we think we’re about to get whiplash from headbanging so much. Don’t underestimate this K-Pop smash. Once again, he has released pop perfection. Taylor Parx – Rebound (feat. Joey Bada$$): One of Ari’s “7 Rings” crew (alongside Victoria Monet), Taylor Parx’s new album “We Need To Talk” has come out featuring our fave “I Want You” as well as collaborations with DUCKWRTH, Cautious Clay and this one with Joey Bada$$. This song is a chilled ballad which wouldn’t be out of place as a track to play after you’ve listened to Khalid’s new album. Bazzi – Paradise: 2018 was massive for Bazzi and it looks like 2019 will be too. “Paradise” has an infectious beat, Bazzi’s vocals are addictive and the lyrics are so repeatable. Once again, he has released pop perfection.